This one is almost too easy to write. 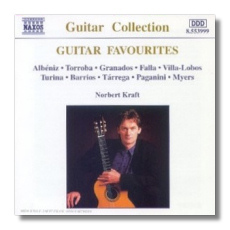 From the opening of Albéniz's Asturias (Leyenda) to the prayer-like closing of Stanley Myers' Cavatina, this is one of the most beautiful, astounding recordings of guitar music I have ever heard. My God, Kraft just reaches out and grabs you in the first few seconds…the whole thing is riveting. Sometimes, here and throughout the disc, you would swear that Kraft has managed to play counter point on the guitar. The sound is spectacular and offers even more evidence that 20-Bit remastering is superior to the 18-Bit. This is one of the most natural sounding discs of a guitar that I have ever heard (and the acoustic guitar was my instrument in the 60s). Over an hour of music. In this case the notes really are not a significant factor; I mean, who cares when you can just put on the music, sit back and enjoy every second. Nuff said.